Summary : The Pacsafe Camsafe V25 Backpack is perfect the the adventurer and photographer. 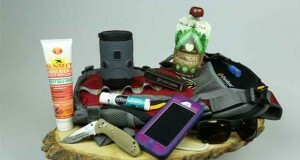 Great for day hiking and traveling abroad. 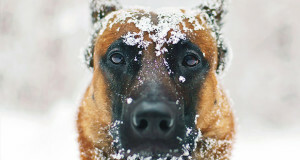 Pacsafe has had a clear goal in mind since the companies inception: keep travellers gear safe from thieves and protected from the rigors of travel. 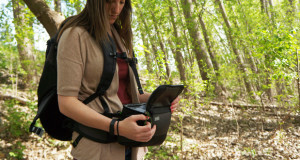 The Pacsafe Camsafe V25 backpack was designed for the traveler who loves to take pictures. 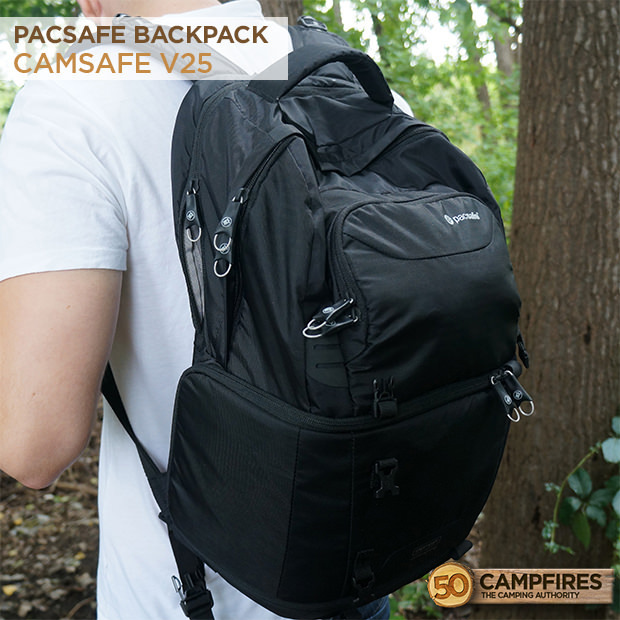 Meant for all travel, from a camping trip to a safari in Africa, the Camsafe V25 backpack will stand up to the elements and make taking pictures easy. 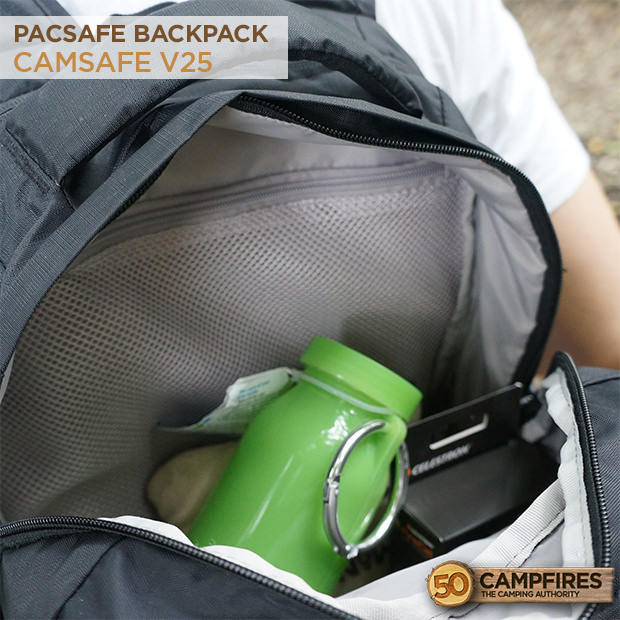 Appearance: The sleek appearance of the Pacsafe Camsafe V25 backpack draws you in immediately. The all black look gives this backpack a ruggedly tough look. The first thing you notice is the amount of zippers, pockets and places to stash gear. 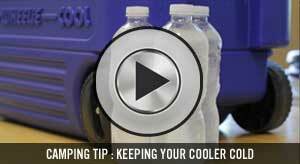 This is always a bonus when you’re going to be using a pack for a longer period of time. 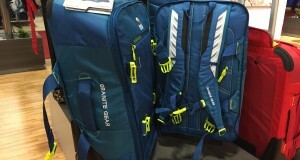 The backpack is geared for photography equipment with the bottom half of the bag, zipping open to reveal a camera bag with removable dividers and pads. 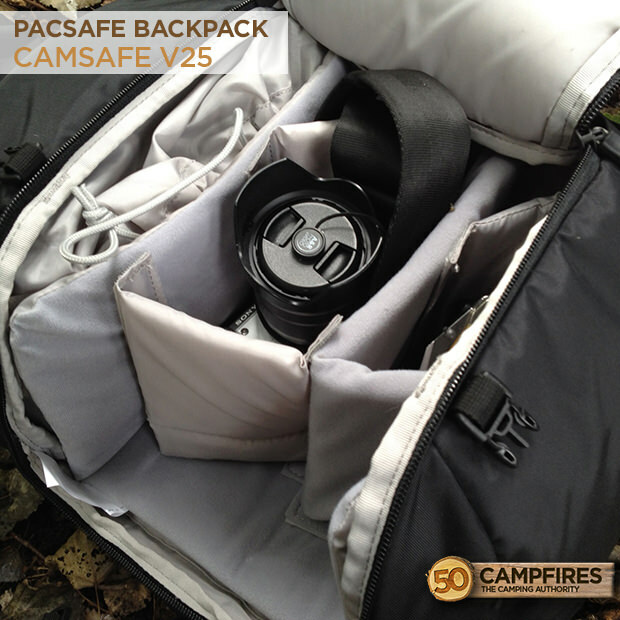 The Camsafe V25 will easily fit DSLR cameras and lenses. We use it for a small video camera, GoPro and microphones. 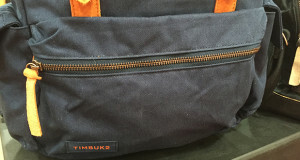 The backpack also features a large zippered area for necessities and a small front pocket for items you want to keep separated. When first looking in the large area, it was confusing as to why there was a drawstring, but I soon realized that if you weren’t bringing camera equipment the pack can easily convert in to a solid 25L backpack. Genius! Another great feature of the Camsafe is the padded laptop area separated from the rest of the compartments, it can also double as a hydration compartment if you’re using it for outdoor activities. 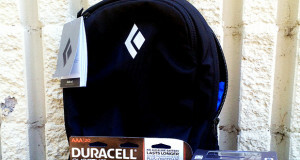 Pacsafe backpacks keep your stuff secure. 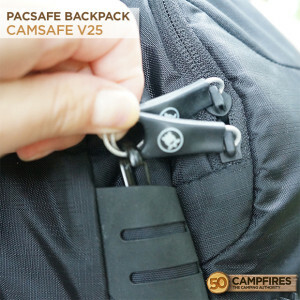 Ease Of Use: Being a backpack meant to keep your belongings secure, the Camsafe V25 is easy to use and keep protected. With 2 nearly hidden clips, you can easily clip the zippers together making it tough for someone to swipe your gear. 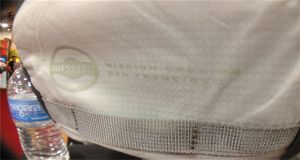 The zippers opened and closed flawlessly providing an easy user experience and a fast way to grab gear on the go. 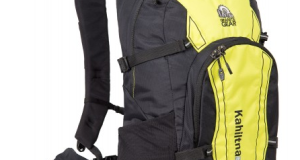 Durability: We first used this pack when traveling to Utah for the Outdoor Retailer Show (a giant outdoor/camping show), it was our sole backpack for 12 hour days walking the showroom floor. Packed full of camera equipment, accessories and a laptop this pack held up to everything we threw at it. Designed for comfort the backpack straps have some great padding along with an extra comfortable padding along the back of the pack. 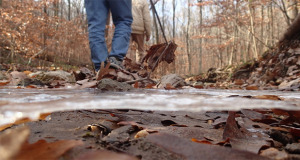 We have since used the pack when out day hiking, taking photos and camping for the weekend. 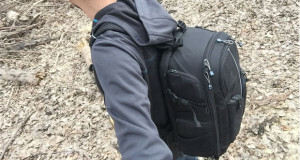 The amsafe V25 backpack has been impressive in quality of design and comfort. 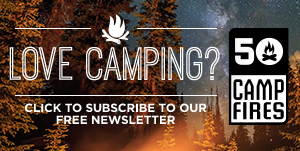 The Camsafe is perfect for hiking as it also comes with a rain fly to truly keep your gear secure in whatever mother nature is throwing at you. Weight: At just over 2 pounds the Pacsafe Camsafe V25 backpack is not going to weigh you down. 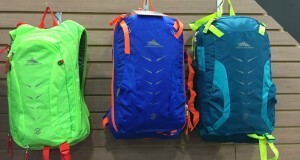 Some backpacks just feel heavy before you even put gear in, that is the makings of a disaster for your shoulders. The Camsafe V25 has already trekked a lot of miles on our backs with out ever feeling that sting in your shoulders of a pack that is just to heavy. Value: At $200 the Camsafe V25 is a bit on the spendy side, but with the overwhelming amount of features it is something we can look past. Being able to carry your camera equipment, other gear, and laptop all in one place while you are on the trail or traveling is priceless.